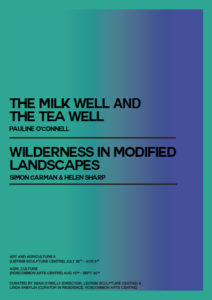 The Milk Well and The Tea Well is the title of a project that started out as a curiosity. Overgrown and covered by a rusty farm gate a patch of rough ground was cleared to reveal two pre-famine stone-lined sunken wells situated side by side. The larger well (on the left) was built to store milk in a churn to keep it cool until it was collected by The Canner destined for the creamery. 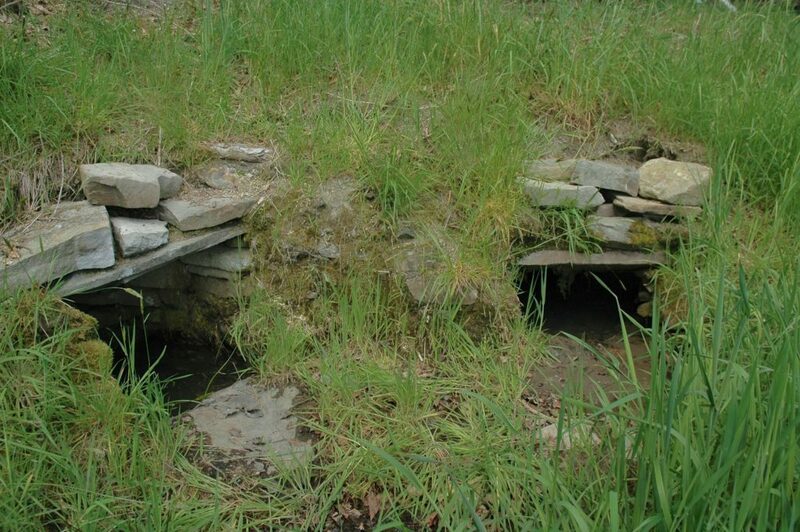 The smaller well (on the right) was used as a fresh water source – for making tea. The project was developed and exhibited in different configurations: firstly, where the research was undertaken – in Manorhamilton, Co. Leitrim; travelling to Roscommon and then was selected for an exhibition in Dublin. Under the thematic Art and Agriculture II, Pauline O’Connell was awarded a six-week research residency at The Leitrim Sculpture Centre Manorhamilton, selected and curated by Sean O’Reilly and Linda Shevlin and funded by the Arts Council of Ireland. The resulting work, in the form of sculpture installation, text, slide projections and two audio repositories, was exhibited at LSC Gallery, Co. Leitrim 25 July – 6 Aug. touring to RAC Gallery, Roscommon 15 Aug. – 26 Sept. and Lacuna 04, Taylor Galleries, Dublin, 3 -25 February 2017 curated by Sabina Mac Mahon and David Quinn. The research centred itself in the town of Manorhamilton and was focused on Killasnett Co-Op Agricultural and Dairy Society Ltd. and it’s 14 auxiliary creameries once active throughout the hinterland or north Leitrim. There were three main strands to the project undertaken, each looking at the specificity of rural culture and its complex relationship to identity politics and indigeneity: through historical enquiry; methods of milk preservation; and, at how this impacted the local /social economy. Engaging the subject of milk preservation (butter making was specific to the area), through a historic lens has implicit questions surrounding mechanization, acceleration, labour practices and gender identity. Exploring milk preservation through an archival lens opens a space where notions of time, agency and hope emerged as a new form of creative translation. This northwest region holds within it a particular nexus of cultural and economic aspiration, a region where one system of inscription has (either) successfully (or not) made way for another. A major contributing factor to this story was the establishment in 1959 of The Shannon Free Trade Zone. This saw the world’s first Free Trade Zone set up near Shannon Airport. The consequence of such incentivised corporate invitations, coupled with farming disincentives (through quotas), meant that there was a considerable migration of farmers away from the land and into factory jobs; thusly impacting the once common practice of dairy farming within the region, petering down to only two dairy farmers remaining in the north Leitrim region today. The Milk Well and The Tea Well, 25 July – 6 Aug., Leitrim Sculpture Centre Gallery, Manorhamilton, Co. Leitrim, touring to Roscommon Arts Centre, 15 Aug – 26 Sept.